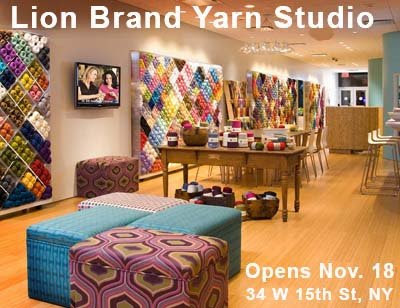 Everyone is buzzing about Lion Brand's studio which opens next Tuesday and located at 34 W. 15th Street between 5th & 6th Aves. I'm excited and looking forward to checking out their variety of yarns. Yarn lovers can anticipate a variety of activities such as workshops, events, meet-ups, fashion shows, book signings, movie nights, and classes. Although there will be yarns swatched both in knitting and crochet to get a close-up of the product results, LB will have a sample wall allowing yarn lovers to knit up a swatch before purchasing yarn, Now!!! that's what I'm talking about...lol. They will also have computers so that we can access LB's pattern library and use the computer to order yarn that may not be available in the store and delivered to us with free shipping. Talk about customer friendly...haha! How cool is that!!! Lion Brand sent me a link and I was like wow, they are suppose to light up Time Square this weekend too for a couple seconds/minutes HOW AWESOME!! Knitters are about to take over the world!! I would love to see this place and be able to play with the yarns! How cool is this? Why must you torture me! I wish I could see this studio. It sounds like a lot of fun and inspiration. "sigh"
Gurl you got me all in the know! That is AWESOME!!! I have GOTTA go visit them when I get to NYC next year!! Now that's something cool! I wish they would open one here too! I'm totally jealous! Maybe I will make an effort to come to NY soon! LOL! I have been waiting for this store to open for months. I am going over their at lunch time since I am only two blocks away !yippy!. This area is so limited in yarn stores. The only closes one is on 14th & 2nd avenue.